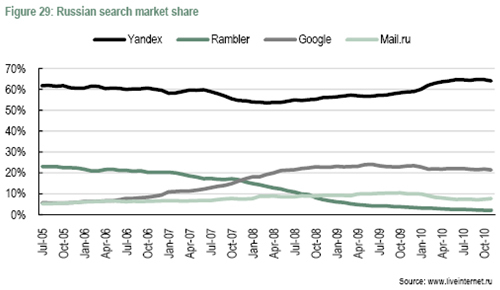 THE YANDEX FLOAT – IS RUSSIAN INTERNET COMMERCE FREE TO WAG ITS TAIL WITH THE MARKET OR THE MASTER? If Yandex, Russia’s leading search engine and internet portal, tells potential share buyers and investors that it is at risk of a hostile takeover by a man like Alisher Usmanov, who owns a stake in the competing Mail.ru portal, then the charge is a serious one. And if to that, Yandex adds the warning that the president of the country may be behind a scheme to consolidate competing public companies like Yandex into a national search engine, then the initial public offering (IPO), launched last week on the US NASDAQ exchange, is a unique test of what otherwise may be called Russian modernization – and the price of betting on it. Source: Russia: FOM, March 2011; all other countries, Euromonitor International, December 2010. FOM measures internet penetration as the number of internet users aged 18 and older as a percentage of the total population aged 18 and older. Euromonitor International defines internet users as those using the internet from any device (including mobile phones) in the past 12 months and generally covers users between the age of 15 and 74; in that population, Euromonitor International reports internet penetration in Russia of 33% in 2010. It isn’t rocket science to realize that buying Yandex shares is a wager on Russia’s relative acceleration into more internet usage, and concomitantly more money spent on internet advertising. When you are on a good thing as good as this, the old slogan is STICK TO IT. Naturally, in a competitive world, this may not be so easy, even as Yandex points out, it is dominant in Russia with 65% of the internet search market. Its nearest competitor is Google, with 22% market share, with Rambler, Mail.ru, Yahoo and dozens of smaller portals trailing far behind. “On the domestic level, our principal competitor is Mail.ru. We compete with Mail.ru in the market for text-based advertising, display advertising and other services. Mail.ru offers a wide range of internet services, including the most popular Russian web mail service, and many other services that are comparable to ours, including some services that are more widely used than ours. We also compete with Russian online advertising networks, such as Begun, which direct advertising to a number of popular Russian websites. This looks like a conventional competitive market. So what are the particular Russian risks Yandex says it is facing? That is boilerplate. But this statement from Yandex and its bankers is stunning: “representatives of the Russian government, including the president, have publicly stated as recently as January 2011 that the development of a “national” search engine is a government priority. Such a government-owned or -controlled search engine, if launched, could create additional competition for our search service, and could benefit from favorable governmental subsidies and other benefits and preferences not available to us.” Note that president goes unnamed. 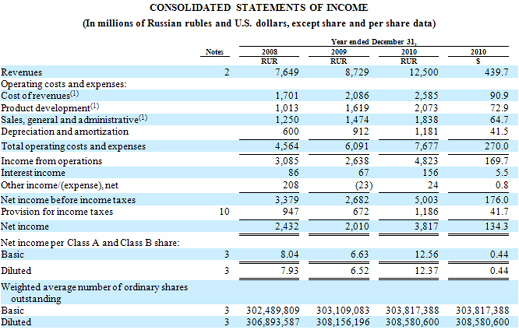 According to Moscow reports, three years ago, before the crash, Usmanov tried to buy a 10% stake in Yandex. 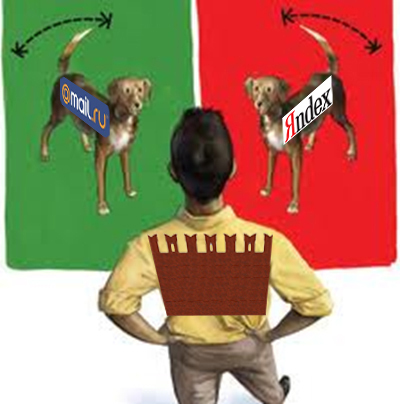 The control shareholders of Yandex – Andrei Volozh with 20% of the voting shares, Baring Vostok Capital Partners, with 24%, Charles Ryan with 8%, and Ilya Segalovich with 4% — refused to agree. The Sberbank golden share, transferred for one Euro in September of 2009, is an insurance premium against a raider making an alliance with some of Yandex’s shareholders to capture the stakes of the others. Voloshin has been hired to keep his ear to the ground in case higher officials are motivated by such a scheme. Yandex’s prospectus says it is aiming at a maximum share sale of $1 billion, and it remains unclear at this point what proportion of the existing shares will be sold. Press reports and market speculation suggest between 10% and 20% will be put on the market, and the reported valuations of the company range from $6 billion to $9 billion. 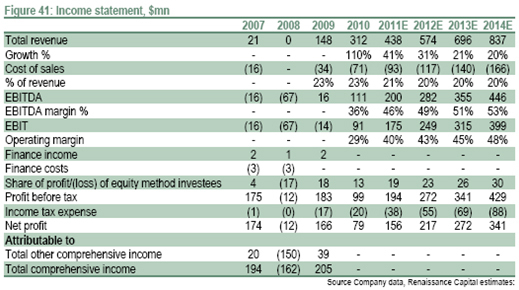 Details of the size of the sell-off by the control shareholders are not disclosed yet in the US documents. The Yandex launch has cast a shadow over Mail.ru, whose share price has been falling steadily since the first-flush enthusiasm surrounding its IPO in London last November evaporated in January of this year. Comparing their 2010 results, it is clear Yandex is the bigger and better of the two. 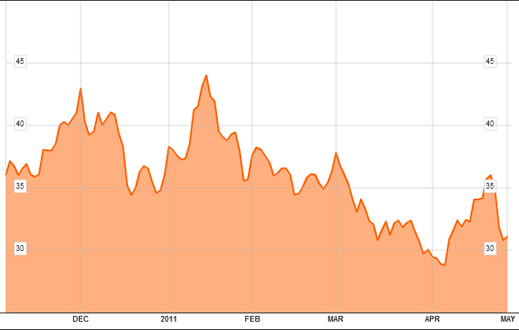 It is also plain that since January, Mail.ru’s financial prospects and share price have been dwindling. Instead of Rencap’s target share price of $43, the current share price is $31. Market capitalization has fallen from $8.1 billion in January to $6.2 billion today. The RenCap report of January acknowledged that compared to its Chinese peer Tencent, Mail.ru was over-valued by up to 25%. Since then the market has moved to cut Mail.ru’s absolute and relative valuations. Tencent, despite seesawing on the Hong Kong Stock Exchange, is currently up 30% in the year to date. Mail.ru is down 14%.